I’v e always wanted to read this series, but I just couldn’t find a copy. So it took me almost a year until I could actually get my hands on a copy. And who wouldn’t want to read this book? I mean, look at these beautiful covers? Not that I’m saying I judge books by their covers, but uhm yeaaaah. Sometimes, I do. But moe often than not, it’s all about the blurb for me. So you see? They’re actually very intriguing. It’s like The Bachelor meets Hunger Games, in a less gruesome way. And at first, it has succeeded in its goal. The writing is seamless, allowing the readers to feel the book as if it were their very lives. The dystopian background could probably be explained better, but the readers could piece everything together eventually. I’m not going to say it’s very original, because it’s not. And the characters are the same fierce, rebellious, strong and with high sense of justice, same old characters with just different names. This is the reason why I stay away from Dystopian literature. I always read the same struggles, from the same kinds of people, with the same angst. It gets tiring. The novelty of reading evocative dystopia wears off after three books with the same thing. Anyway. So back to the review. To be completely honest, I liked the first book. It wasn’t hard to read, and it felt less deeper than I expected. It’s not a bad thing, but it’s not the book’s selling point either. I was expecting real complex political undertones, and a more moving crisis. But the first book works just the way it is just fine. America Singer is a very grounded and practical girl, who works with her family to support themselves by performing at the every few holidays their era has, her sister paints, and her brother still uncertain to what his talents are. She is secretly in love with her neighbor, boy-next-door Aspen. Aspen is in a lower caste than theirs, and with his personality – prideful and rather chivalrous despite when they are living – they often argue about the dynamics of their relationship. The book opens as America’s mother convinces her to join, or at least fill up the application form for, the Selection. 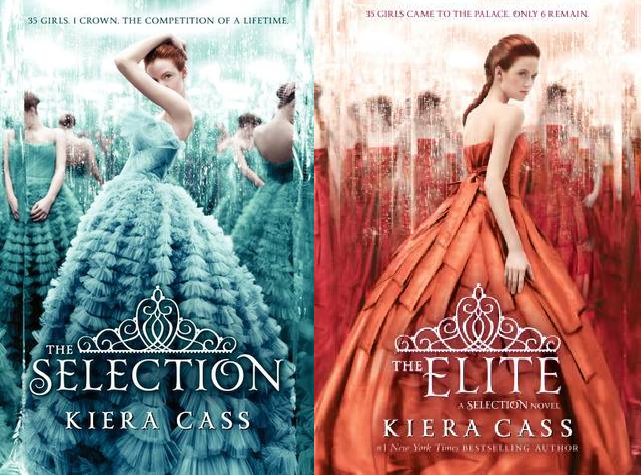 The Selection is this competition where thirty five girls from all over their little country of Illea are selected to live in their palace, and spend time with the Prince so that eventually, he could pick who his future bride’s gonna be. Basically, The Bachelor. The Prince, during the first parts of his apperance, is actually rather new, in terms of a character. Almost original, you could say. He speaks in this incredibly awkward formal English. I thought he was going to stay that way. Yet another disappointment for the book. The Prince just morphed into another generic love interest. So while in the Selection, America can be seen as the Selection’s Miss Congeniality. She is rather blunt and forward, prefers to stay simple and classy unlike her competitions who’re always over the top. She is predictably strong and holds her principles of right and wrong close to her heart. And also predictably, she wears her heart on her sleeve. But like any other dystopian heroine, I was expecting her to fight for her own battles, remain strong and steadfast and not let herself be swayed by frivolous entanglements called love interests. Book one was good. It wasn’t bad, but it’s not great either. But the second book, I don’t even know where to begin to explain where this book began destroying itself. It’s like reading Twilight all over again, to be honest! I am just so disappointed with the direction this book started and where it has gone with this second installment. Book one ended in a cliffhanger, with America resolved to actually fight for her spot in the Selection now that she’s been included in the Elite. Book two opens with America and Maxon trying to to be together. The rebels become more aggressive in this book, which prompted me to thinking there would be more social relevance in this book. Well, there kind of is, in the form of Marlee’s and her officer’s forbidden love, which the author thinks would ripple in Aspen and America’s rekindling relationship. I am so irritated with this, you guys have no idea. It’s such a poignant event in the book that is wasted by the characters. Ugh. Marlee’s and Officer Woodwork’s tragic love story ended in front of their very eyes. While America mulled over this unfair judgement for a tiny moment in history, she still pursues a relationship with Aspen – rather too quickly, might I add – while still promising Maxon that she’s basically agreeing to date him. Can you see how wrong this all is? I understand how America is still in love with Aspen after all these weeks, but she admittedly likes Maxon already. It is a tough situation, but she has already given her word to Maxon that she likes him and would like to try where they could be headed. Aside from the fact that they are legally bound to NOT pursue love interests aside from that of Maxon’s. Doing so is freaking treason, for goodness’ sake. I’m not saying America should strictly abide by these rules, their contracts. No, they are flawed. But this one rule, it shouldn’t even matter in the grand scale of things. BUT. The fact that she’s already agreed to date Maxon, she should’ve maybe thought twice or longer about jumping into a relationship with Aspen. It didn’t seem she had a hard time pursuing thi avenue, to be honest. I can understand Aspen’s thinking. However, I still can’t imagine how he still pursued America relentlessly despite, I don’t know, they could be caned, hanged to death, with their relationship. For someone who has let go America for less reason than death, this is all idiotic. And please do not even begin to tell me this is Aspen’s “character development”. It’s not development. It’s also unreasonable. I am just disappointed that this book turned into this. There was so much this book’s premise could offer, but it turned to be yet another Twilight-esque book. It’s very frustrating to see a girl, perfectly capable of standing on her own, be so stupid with her love choices. It’s not even about shipping or love triangles in itself. The fact that America, despite Marlee, did not even hesitate to be with Aspen while with Maxon is just sad. Sad that here is yet another book endorsing to females out there that in a world full of social unjust and rebels fighting and finding some unknown cause, a girl who could make a difference in the political hub of their country, threw away everything just to be with her ex-boyfriend. It is noble. It is also idiotic. Maxon could also be a great character. He could have been a politcally active underground, spurring rebel attacks against his father in order to change their extremely flawed society. Instead, he is yet another passive symbol of power. And no, I am not impressed with what he did for Marlee and Woodwork after their public punishment. He could have done more. He could do more. Aspen is an excessive character, for me. He is important, but ughhh. In the grand scale of things, I could do without his character. I did not finish this book. I did browse through the ending. I did not thought this book was even capable of ruining itself even more until I saw the last parts of the book. It’s horrifying. I keep saying, “in the larger picture”, because I believe this book could have been as great as Divergent, Delirium, The Hunger Games, with the right decisions in the turn of events. If all the political chess is going to be revealed in the third book, it will all go to waste. There is a very weak and shaky foundation planted in the first two books. Cass could have made this better. In the end, it turned out to be a chick lit who tried so hard to be a dystopian literature, until it got tired quarter of the way in the second book.